The work on the boat goes on at a steady pace. The old saying that life is what happens to you when you are making plans is all too true. Our original plan when the boat was purchased was to be on our way to the Bahamas by now. Things obviously did not work out that way but maybe that is not such a bad thing. In as great condition as the boat was when we bought her, she is in need of a LOT of work before she is able to comfortably do any long distance cruising. It appears that we will be here in Beaufort until at the very least next year. That might seem like a long time but with the work we need to do and the need to raise enough money to pay for all of the improvements and keep the cruising kitty intact, the time will fly. When we left on our previous boat to cruise from Houston to come here, it might have been the first time the boat was completely equipped and tested and we were not still working on projects as we headed out. It was a nice change from the past and we would very much like for this boat to be in that condition when we next leave the dock for a while. More and more cruisers, be they just weekenders or long distance travelers, are wrestling with the issues of staying connected and yes, I mean to the internet. 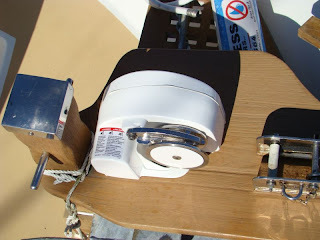 My first boat had nothing more than a VHF radio and I was able to sail from the US mainland to Bermuda. Later on as the boats got larger and communications improved, a marine SSB radio was added. Then a famous person, I can’t remember who, invented the internet. With that, the ease of email crept into our lives and grew like a weed along the banks of some of the rivers we have traveled. We were hooked and began the search for the latest and greatest technology. Our first device was a hand held unit that was called Pocketmail and needed to be held up to a phone after calling a special number and it would send and receive your emails. It was a pretty neat device and very popular in the cruising circles. Next we added a Pactor modem to our SSB radio and after acquiring a Ham license, used the Winlink system to send and receive email and get that all important weather information. 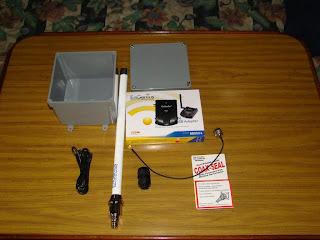 We still have and use extensively the Winlink system. But the more we were exposed to the internet itself, the more important it became and the more functional we found it to gather information on weather, emails and the areas we were traveling- something the Winlink could not do for us. We have just had a couple of days of some pretty steady rains and found out we have not yet resolved all of our water leaks. The good news is that the serious ones have not resurfaced and it appears that right now we have only one to deal with. This one is in the forward cabin coming from the area of the cap rail. We are assuming this is coming from the stanchion bases since that is one area we have not sealed yet, so that is priority since rain is forecast again in a few days. After removing fasteners from the bases we are pretty certain this is our problem. 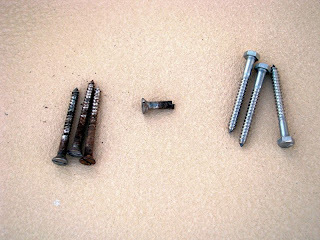 The old screws are loose, rusted and broken and most are the originals. 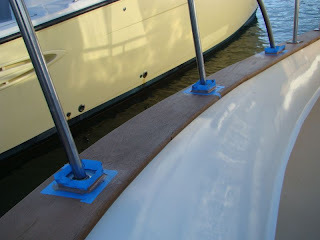 As is our usual deck repair, once the fasteners are removed we fill the holes with a thickened mix of West System epoxy. This seals the wood around the holes and perhaps some of the spaces where the water can pass through. Prior to filling anything the areas are taped well to make a cleaner, neater job when it is finished. A small hardwood dowel is inserted in the holes to give the new fasteners something to grab to. A healthy dose of caulk is injected into the hole and the fasteners are also coated with caulk. I am using stainless steel lag bolts in place of the old slotted screws. This allows me to tighten them more than with a screw driver. One of the little tricks is to not tighten too much and allow the caulk to dry. Then come back and tighten the fasteners later and the dried caulk will actually form a gasket. The tape is also removed after the caulk is dry and the caulk is trimmed to make a finished look. The radical change in fasteners also makes it very apparent which ones still need to be replaced. One of the more fun projects is completed and that is the installation of the new stereo system and six disc CD changer. We have used Clarion products in the past with good results and performance so stayed with what we know. The hard part was getting the panel cut to flush mount the CD changer since they are not designed for this. The Clarion also allows us to run audio cables to it and connect those from the output of the TV. With four new stereo speakers mounted forward and aft in the main cabin we now have surround sound from the TV and DVD player without the large entertainment systems taking up valuable space. 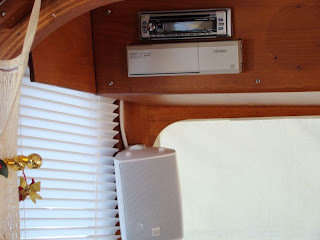 We found marine stereo speakers by Dual at Boaters World at a great price and they sound fantastic. Now the TV, DVD player, CD changer and of course the stereo itself are all together. With the DirectTV satellite system we also have satellite radio which now can be sent through the stereo. The teak master is also starting on all of the outside teak, and there is lots of it. The former owners put a deck stain on all of the teak and while this did protect it we need to remove it all for the refinishing process. 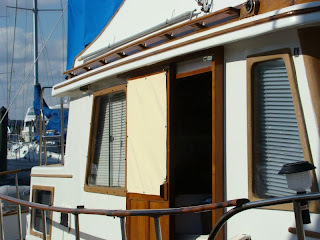 We also had lots of exterior teak on our previous boat and have been down the varnishing and other finishes path for a lot of years. We have recently settled on Sikkens Cetol and don't regret it one bit. It is much, much easier to apply and maintain than varnish, looks great using the Natural Teak and lasts much longer than varnish in the tropics. Adding maintenance coats is a snap. But we are just in the beginning stages. Battery charging has been on my mind of late and charging the starting battery without overcharging has been a consideration. I have decided to use the Xantrex Echo Charger for the starting battery, rather than try and connect it to the house charger. 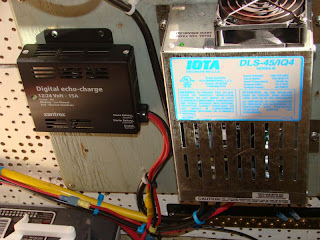 This is a simple connection from the house bank to the starting battery and it senses when the starting battery needs a charge and borrows it from the house bank charger or alternator. Otherwise the house charger and alternator are connected to and charge the house bank. It solves my charging problems and does a very efficient job. The windlass is also in the starting phase. 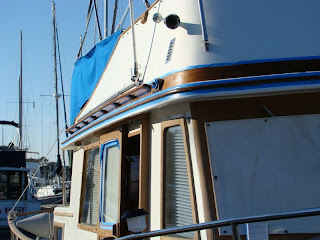 It is mounted on the bow platform but I still need to do the wiring and install switches, etc. The water leaks have caused a few things to be put on hold until they are resolved but the windlass will be a pretty straight forward install. We will also need to upgrade our anchor rode and chain but all things will get done eventually.